Exploding stars: Supernova found is most distant of its kind yet. 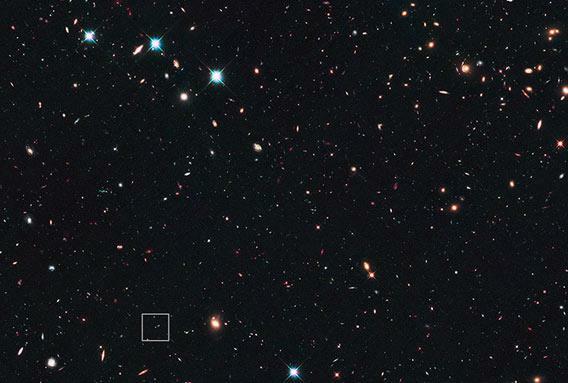 A deep image of the sky taken by Hubble reveals the most distant Type Ia supernova yet seen (lower left, in the box). Click to chandrasekharenate. I don’t generally post record-breaking discoveries—most distant, brightest, etc.—because most of the time those are incremental steps. Cool, but not critical to our understanding of the Universe. Sequence showing the supernova more clearly: the galaxy (left), the galaxy during the supernova event (middle), and the supernova itself after the galaxy light has been subtracted (right). Click to embiggen. On the left is an image of the galaxy taken before the star blew up. The middle one shows it when the supernova was near its peak, and on the right is the middle image with the left one subtracted away. That removes the galaxy light, leaving behind just that from the supernova. The galaxy is at a staggering distance of about 10.5 billion light years away; the Universe was practically a toddler when this star blew up. Exploding stars have been seen farther away than this, but the key part of this is the kind of supernova it is: It’s called a Type Ia, and it happens when a white dwarf star explodes. Most people think of supernovae coming from massive, hot stars. Those get a lot of press, but the Type Ias are important too. We think they all explode with roughly the same amount of energy, making them what’s called a “standard candle”, a way of easily measuring their distance. If they are all the same brightness, then ones that look dimmer are farther away, just like a candle a hundred meters away is faint compared to one right in front of your eyes. In fact, Type Ia supernovae were the kind used to figure out that the Universal expansion is accelerating due to dark energy, one of the biggest scientific discoveries in modern history. An important step in determining that is finding ever-more-distant Type Ia supernovae, because that gives us a better handle on what the Universe is doing in its farthest reaches. This new find, temporarily named SN UDS10Wil, breaks the previous record by hundreds of millions of light years, greatly expanding (pun intended!) our knowledge of the distant Universe. The supernova was not found by accident, either. In 2010, astronomers started observing the sky as part of the CANDELS+CLASH Supernova Project, observing and re-observing the same patches of the sky. Supernovae take weeks to brighten and fade, so by looking at a big patch of sky over and over again, and by taking very deep images to see faint objects, catching supernovae is inevitable. 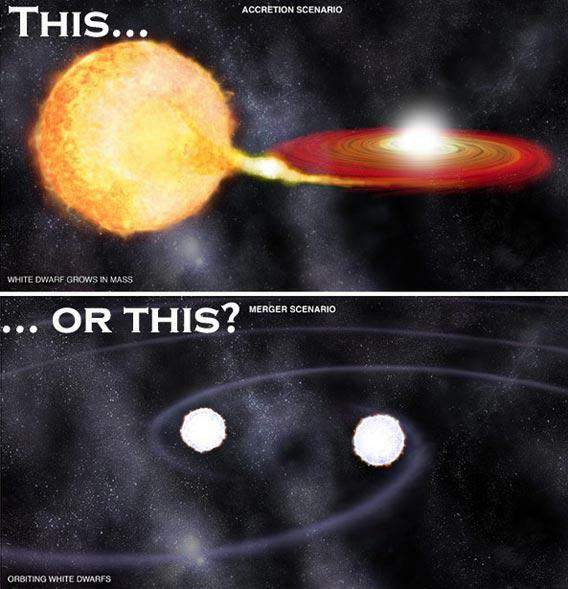 Two scenarios for a Type Ia supernova: a white dwarf siphoning material off a normal star (top), and two white dwarfs mergin (bottom). The CANDELS+CLASH survey is finding something else that’s interesting, too. There are two ways to make a Type Ia supernova. One is for a white dwarf to draw matter off a normal (Sun-like) companion star, gaining mass until it explodes. The other is for two white dwarfs to merge, causing them to blow up. Given how stars are born, age and die, the first scenario can start occurring not long after the Universe itself formed, just a billion years or so. The second one, though, takes far longer, since the two white dwarfs have to spiral in and merge, a process that takes billions of years. If you look far away in space, you’re looking back in time, so you can take a survey of what’s happening when. The CANDELS+CLASH project has found a drop-off in Type Ia supernova from roughly seven to 10 billion years ago, making it look like the double-dwarf merger is the more common type going off back then. This jibes with other research done looking in the local Universe as well. I find that interesting indeed. Both mechanisms occur to create Type Ia supernovae, but knowing which is more common, where, and when, tells us more about the way the Universe works. Supernovae like this are a fantastic tool for understanding the cosmos. Bright, easily seen over billions of light years, occurring everywhere, and happening in such a way that allows us to quantify them (apply numbers and math to them): all of this makes them the Swiss Army Knife of astronomy.